Florida-based pro Jessica Dawley edged out Jill Pike in only four hands of heads-up action to win the 2018 WSOP Ladies Championship. 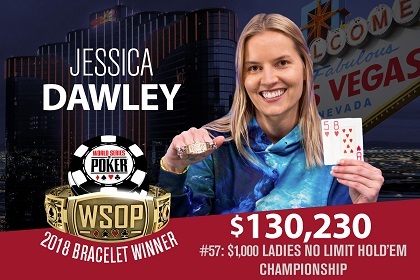 Dawley banked $130,230 in cash, plus her first WSOP bracelet. This year's Ladies Championship attracted 696 ladies and a prize pool worth $626,400.